Phantom pain is an intriguing mystery that has captured the imagination of health care providers and the public alike. How is it possible to feel pain in a limb or some other body part that has been surgically removed? Phantom pain develops among people who have lost a limb or a breast or have had internal organs removed. It also occurs in people with totally transected spinal cords. Unfortunately, phantom pain is a medical night­ mare. Many of the people reporting phantom pain make dispropor­ tionately heavy use of the medical system because their severe pains are usually not treated successfully. The effect on quality of life can be devas­ tating. Phantom pain has been reported at least since 1545 (Weir Mitchell as related by Nathanson, 1988) and/ or experienced by such diverse people as Admiral Lord Nelson and Ambroise Pare (Melzack & Wall, 1982; Davis, 1993). The folklore surrounding phantom pain is fascinating and mirrors the concepts about how our bodies work that are in vogue at any particu­ lar time. Most of the stories relate to phantom limbs and date from the mid-1800s. The typical story goes like this: A man who had his leg ampu­ tated complained about terrible crawling, twitching feelings in his leg. His friends found out where the leg was buried, dug it up, and found maggots eating it. They burned it, and the pain stopped. Another man complained of a swollen feeling with frequent stinging or biting pains. This unique volume explores the mystery of phantom pain, providing a thoroughly unified approach to understanding this phenomenon from basic neuroscience to clinical practice. The author and contributors integrate the most current information on central and peripheral mechanisms of pain with data on characteristics, demography, and evaluations of treatment efforts to produce a coherent view of the problem. Special features include numerous illustrations of phantom sensations from the amputee's point of view and a guide for amputees which offers understandable information about the entire process from pre-surgical procedures to rehabilitation. 1. 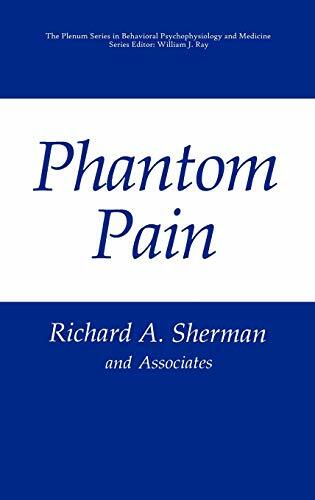 Phantom Pain (The Springer Series in Behavioral Psychophysiology and Medicine) [Hardcover] Sherman, Richard A.